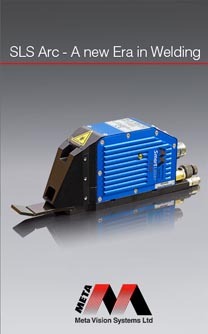 Smart Laser Pilot (SLPi) is a non contact weld seam finding and tracking system for robot welding. By mounting the Smart Laser Sensor (SLS) to the welding torch so that it looks ahead of the welding point, the Smart Laser Pilot adjusts the robot path to keep the welding wire positioned correctly in the joint. Perhaps the single biggest problem in robot arc welding is to make sure that the welding wire is always in the right place in each and every joint to produce a good weld. Variations in the position of weld joints arise from several sources: from variations in the parts themselves, for example from springback in pressings; from variation in jigs and fixtures; from differences in the ways that parts are tacked together, etc. In addition to these setup errors, thermal distortion from the weld itself can cause further dynamic changes as the weld is taking place. Smart Laser Pilot solves these problems by sensing the actual position of the weld joint in real time before and during the welding process. Smart Laser Pilot is a completely new approach to seam finding and tracking for robot welding. The image processing hardware and software are contained with the Smart Laser Sensor itself. Combined with the latest Mega Pixel camera technology, special custom optics and incorporating over 25 years of robot welding know-how and experience, SLPi represents a major breakthrough in the use of laser vision in robot welding.